Size: 30 x 37 cms. Title: 'Karte von Nord-America, zur Geschichte voh Neu Frankreich'. 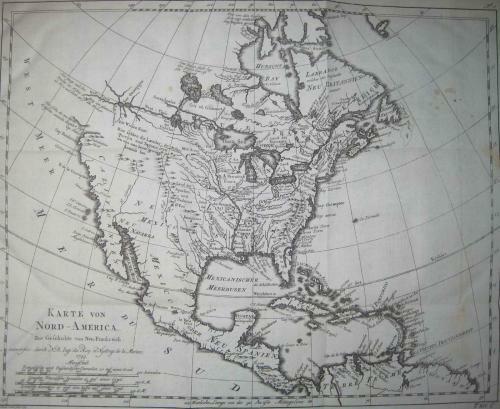 A rare German early edition of Bellin's North America map that illustrates the travels of Pierre Francois Xavier de Charlevoix. The most distinctive feature of the map is the River of the West shown as a definitive waterway flowing west from Lake Superior to the Pacific Ocean. This map is one of Bellin's earliest maps of any part of North America.